The 2018 Nobel Prize in Physiology or Medicine has been jointly awarded to James P. Allison and Tasuku Honjo for their discovery of cancer therapy by inhibition of negative immune regulation. During the 1990s, in his laboratory at the University of California, Berkeley, James P. Allison studied the T-cell protein CTLA-4. He was one of several scientists who had made the observation that CTLA-4 functions as a brake on T cells. He had developed an antibody that could bind to CTLA-4 and block its function and now set out to investigate if CTLA-4 blockade could disengage the T-cell brake and unleash the immune system to attack cancer cells. Allison and co-workers performed a first experiment at the end of 1994 that showed that mice with cancer had been cured by treatment with the antibodies that inhibit the brake and unlock antitumor T-cell activity. In 1992, Tasuku Honjo discovered PD-1, another protein expressed on the surface of T-cells. 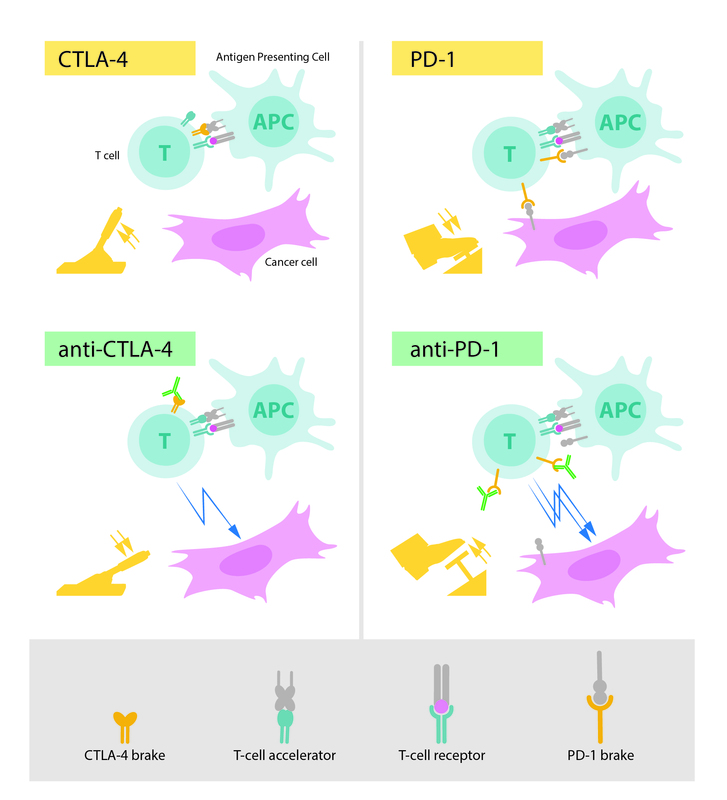 Experiments performed over many years in his laboratory at Kyoto University showed that PD-1, similar to CTLA-4, functions as a T-cell brake, but operates by a different mechanism. In animal experiments, PD-1 blockade was also shown to be a promising strategy in the fight against cancer, as demonstrated by Honjo and other groups. This paved the way for utilizing PD-1 as a target in the treatment of patients. Clinical development ensued, and in 2012 a key study demonstrated clear efficacy in the treatment of patients with different types of cancer.